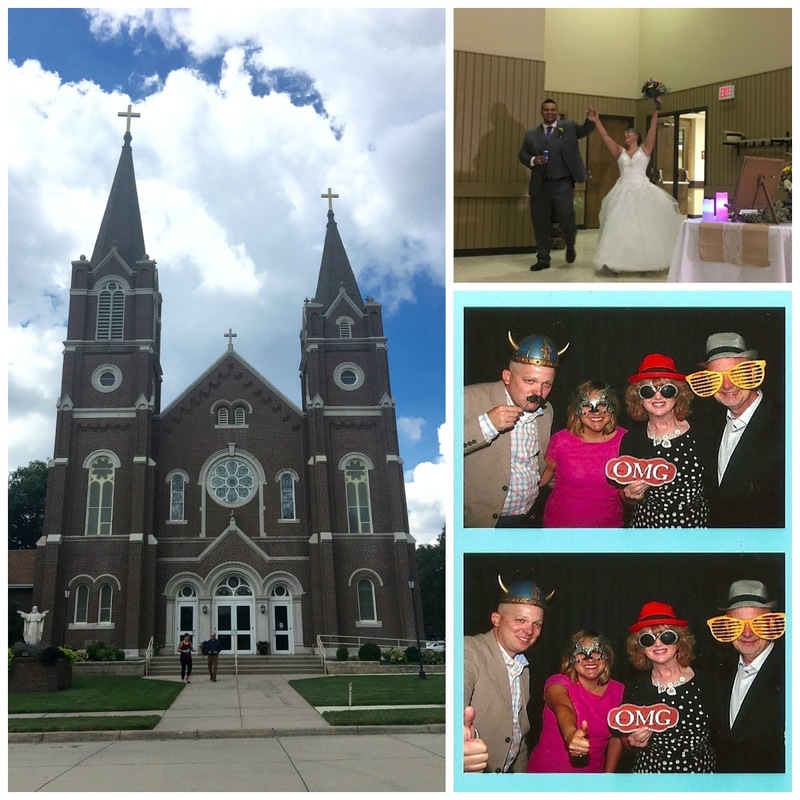 We had a wedding to attend in Colwich, Kansas over the weekend. Upon further planning for the trip, we realized that it would be too far to drive in one day considering that we were not getting out of St. Louis until 2:30 on Friday. 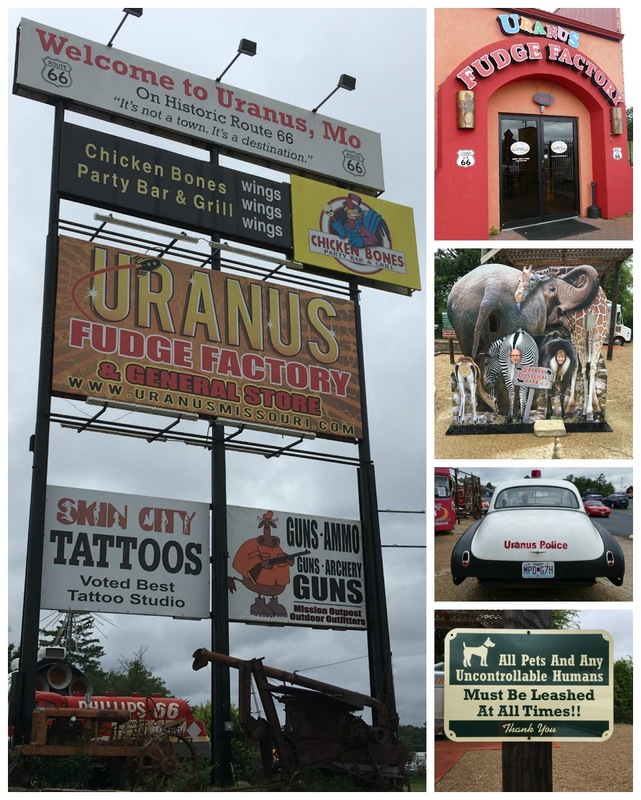 We went as far as Kansas City and spent the night with Jim's sister and her fiancé. It was a quick visit, but it was nice to catch up with them both before continuing on our way at 10:00 Saturday morning. We arrived at our hotel in Maize, Kansas (a northern suburb of Wichita) at 1:00, and fortunately they had our room ready so we were able to freshen up before heading over to Colwich at 1:30. That was a short drive of 4.5 miles, so we arrived in plenty of time for the 2:00 ceremony. Held at the Catholic church in town, the service lasted 1.5 hours and was the most traditional mass we have attended since the '70s. The reception was held in the parish hall, so we just had to walk next door. It was a very nice event, and we got to see a totally different side of the priest. Still dressed in his black cassock, he sure could cut a rug on the dance floor! He knew all the dance steps as well as the words to the songs. It was fun to watch him. We might have spent a bit of time in the photo booth as well. When I looked out our hotel room window the next morning, I was treated to the site of three hot air balloons floating across the golden sky! I looked for Dorothy and Toto, but they were nowhere to be found. Following breakfast, we drove to Derby, Kansas to see one of Jim's projects. Though it took us about 50 miles out of our way, it was nice to see as Jim had not been there since completion. From there we went to Baldwin City to have lunch with one of Jim's motorcycle riding buddies. Jimmy is a police officer in Lawrence, and while I have met him many times I had not yet met his wife. I'm glad we had the chance to change that. We then took a quick stop at JoEllen's house again as we had forgotten our cooler and ice packs there when we left Saturday. It wasn't too much out of the way, and we'll need those for our next trip. Then we finally got on the road for home. Unfortunately we had rain for 2/3 of that journey, but despite the ugly clouds nothing severe happened. We put nearly 1,000 miles on the car over 3 days, and that is a bit much for my liking. But seeing family, friends and celebrating the next chapter in the lives of a great young couple made it worthwhile. Living in an area that would be experiencing a total solar eclipse on August 21, for the past few months the news and my Facebook feed were filled with stories and information about the first total solar eclipse to hit the continental U.S. in 38 years. For those of us in the greater St. Louis area, the last total eclipse was in 1442! So it was kind of a big deal, to say the least. But before experiencing the eclipse, Jim and I celebrated our 39th wedding anniversary on the 19th. 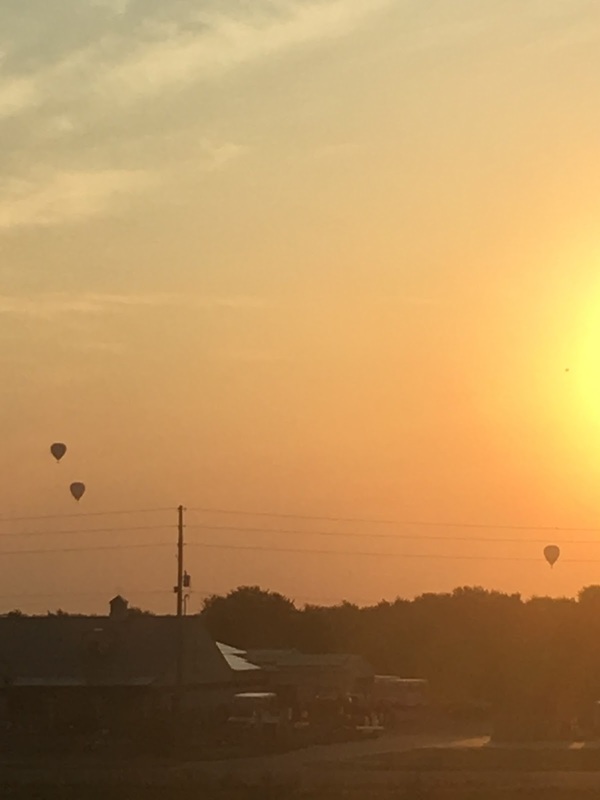 Our friends, Kathy and Paul, traveled to the area from Minnesota for the eclipse and spent the weekend with us before heading off to a relative's lake home in Illinois. It was special for us that they were here on Saturday as they sang at our wedding all those years ago. 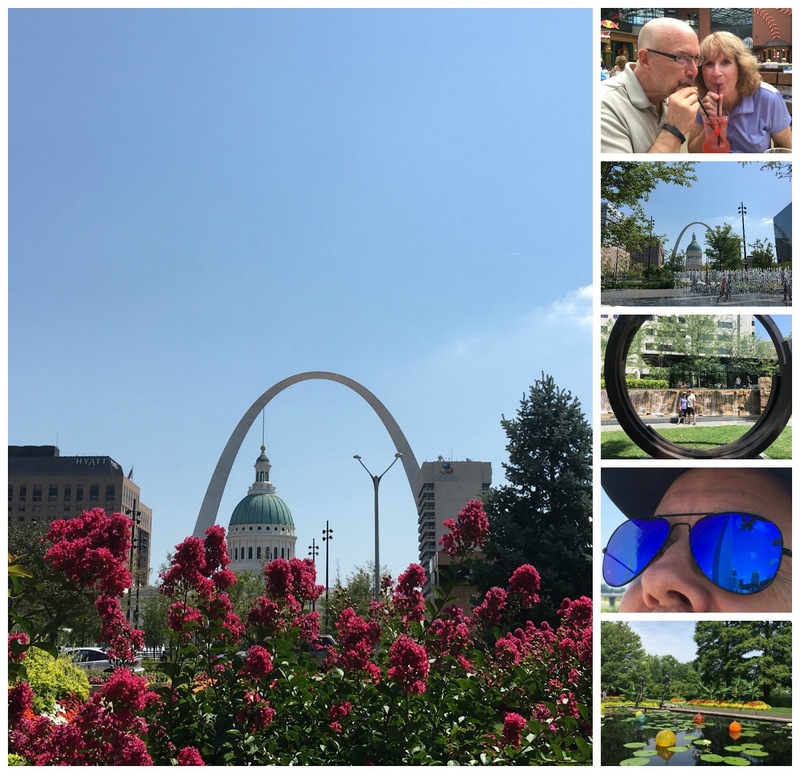 In addition to visiting, we explored the new green space downtown as well as the beauty of the Missouri Botanical Garden. It was a great weekend! For the eclipse we were invited to a friend's lake house located about 45 minutes away. There were reports of how horrific traffic would be following the eclipse, and that coupled with the fact that I wanted to be able to play with my cameras during the event cemented my decision to stay home. While our house would only experience 1 minute and 16 seconds of totality as opposed to the 2 minutes the lake house would get, other factors weighed in on the decision to have a friend over and do things my way. I had taken a class at a local photography class on how to photograph the eclipse, but I decided not to invest $110 on a solar filter that I would only use once. That being the case, the only safe time for me to take a photo of the eclipse was during totality. That was fine - I just wanted to experience the solar eclipse and not be viewing it through a camera lens. I chilled a bottle of Moscato for "toastality", and Diane and I enjoyed a nice lunch inside before sitting on my front porch to enjoy the show. While it was hot out, a couple of fans cooled us between the times we ventured out of the shade to safely view the moon's progress through our eclipse glasses. As totality drew near, I set up a small video recorder, not directed at the sun, to record the changes in light and sound. Unfortunately a neighbor's dusk to dawn lights came on and messed up my light sensor, so that was a bust. Looking down at the ground, the appearance of moon crescents through the leaves of the trees was fascinating to see. During totality the temperature dropped about 5 degrees, the birds silenced and the cicadas started chirping. Removing my glasses, I took a quick shot of the moon. 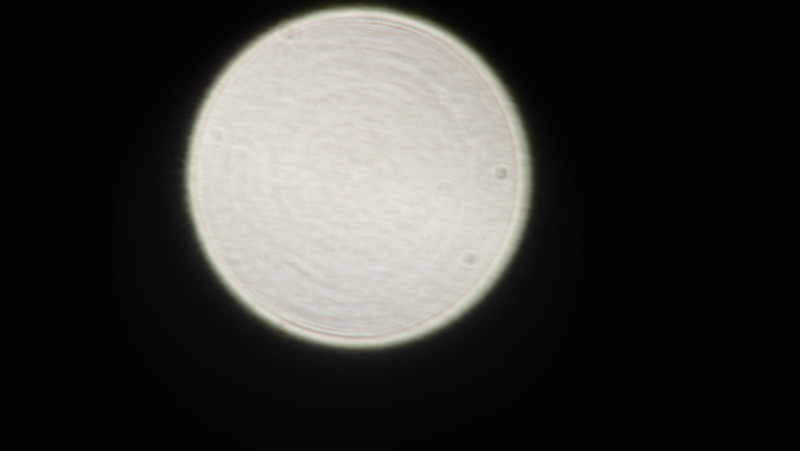 I have no idea why my moon picture is white as all the others I have seen are black with a white ring. I would say that I blew the photo out, yet it is curious that you can see a couple of craters on the moon. It's a unique shot, at any rate. For all the hype surrounding this eclipse, I can honestly say that it was totality worth it! Summer is winding down in my neck of the woods, perhaps sooner than normal as we have been blessed with temperatures in the 80s during the day and 60s overnight. 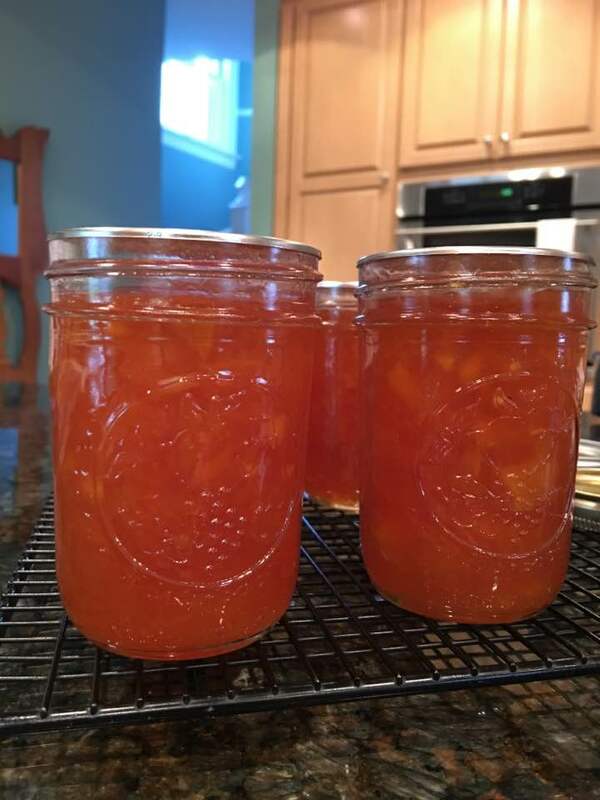 Peaches are abundant right now, so I decided to try my hand at making peach jam. For the first batch, I made five jars of peach and five jars of a peach/blackberry mix. 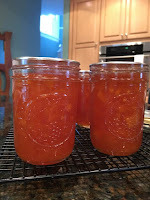 As the peach turned out well (haven't tried the mixed jam yet), I made a second round of peach on Saturday. For whatever reason, the peaches did not ripen as much as I would have liked, which made them challenging to smash with the potato masher. Consequently, I'll have to say that the end result is more peach preserve than peach jam. But I'm okay with that. The flavor is still quite good. 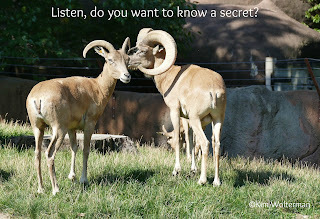 Sunday morning I met my photographer friend Caren at the St. Louis Zoo. With temperatures in the 60s when we started out, it was a perfect time to experience the animals. Because it was a Sunday, the zoo was not yet crowded so we were able to stroll and photograph at our leisure for the first hour or so. By the time it got really crowded, we were ready to head out anyway. I had yet to visit the Grace Taylor Broughton Sculpture Garden behind the St. Louis Art Museum, so we walked there next. It was slightly disappointing, to say the least. 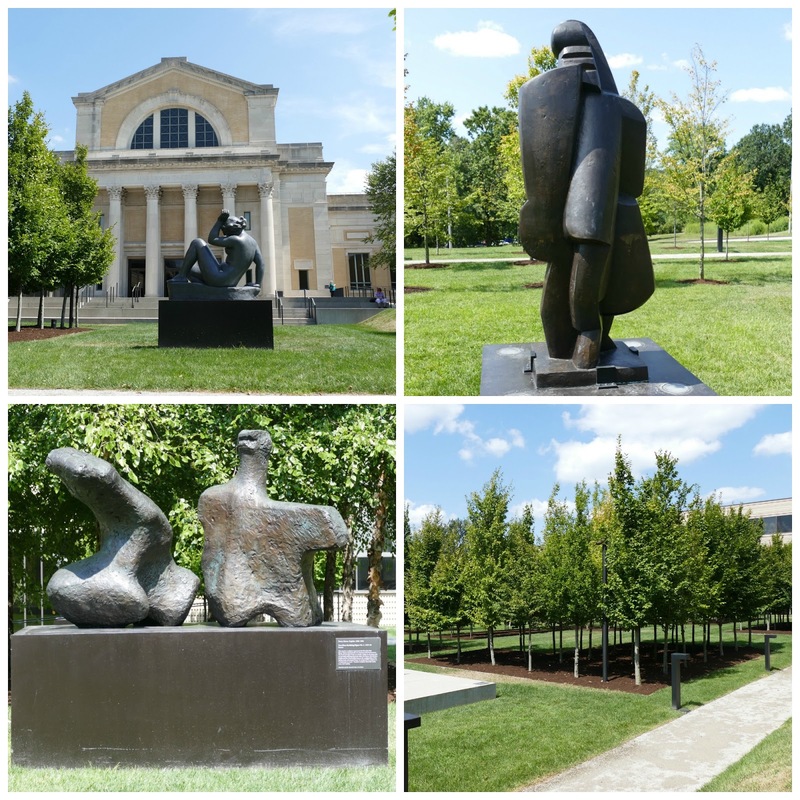 There are no paths leading to each sculpture so you have to walk on the grass. As the irrigation system had been on that morning, it was a soggy endeavor. And I have no idea how the project met ADA requirements as I can't imagine pushing a wheelchair (or a stroller, for that matter), let alone trying to maneuver a walker through the area. Over 400 hundred trees have been planted, some purportedly representing "rooms", but all I could see was too many trees planted too close together. There will be tree casualties due to this, and that is a shame. Perhaps they should consider using a local landscape architect next time, instead of bringing someone in from France. We then headed inside to have an early lunch at Panorama, the restaurant located inside the museum. This was my second time eating here, and I have found both the food and the service to be quite good. Caren and I had both parked in the open lot across from the museum when we arrived that morning, so it was an easy walk back to the cars following our meals. It was good to get out and photograph again. It's been too long since I have taken time to do that. Last weekend was the annual float trip for our company. The past several years it has taken place on the Huzzah River at a facility where we shared a cabin with another couple. I am not a fan of sleeping on the ground anymore, especially in Missouri in August. The younger associates and their families pitched tents or brought campers along. This year the organizer selected a campground on the Niangua River near Lebanon, Missouri. Unfortunately, all the cabins and rooms in the lodge were already taken when our group signed up, so I called every motel in Lebanon only to find out that they were all booked as well. This was the first indication that the river would be packed with floaters on Saturday. I am suspicious that all the campsites were already full when the organizer called, judging by where they ultimately put our group. Located by the porta-potties and the dump station for the RVs, I'm convinced that they created space for us once they found out how many were coming. It's all about the almighty buck, after all. Still not interested in tent camping, ultimately I found a house for the four of us on AirBNB, and as it had a two night minimum during the summer, I booked us for Friday and Saturday nights. The house was perfect for two couples, and it backed up to a city park so it was nice to sit outside and enjoy coffee or another beverage. We drove separately from the other couple as we wanted to take some time to explore the area on Sunday and they needed to get back. We grabbed dinner to go in town and took it out to the campsite Friday night. Most of the group had arrived, with only a couple driving down on Saturday morning, so we sat around the fire until 10 or so before going back to our house. Saturday morning dawned cloudy and cool, with a revised forecast of rain. By 10:30 we were on the water. 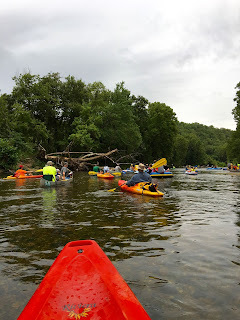 Most of our group chose to float in individual kayaks, but a few had rafts or canoes as they had children or dogs with them. I have never seen so many people on a river before! 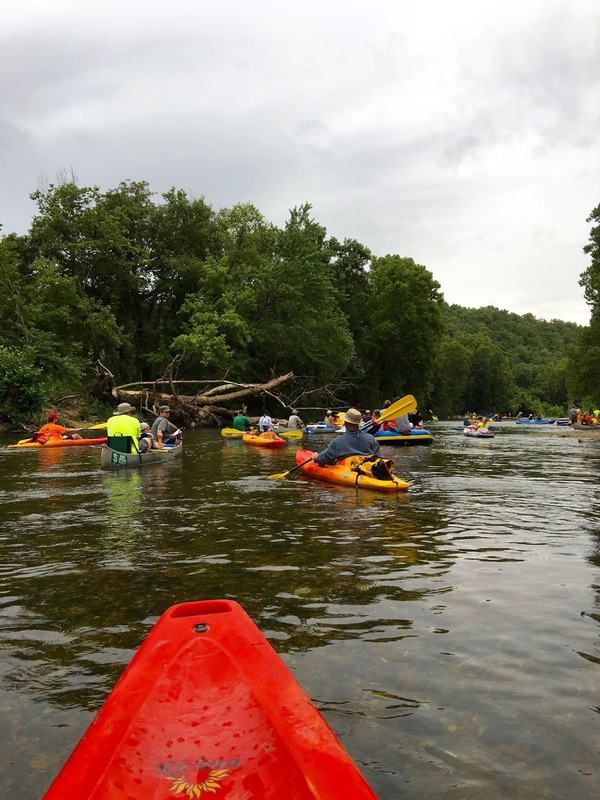 It was packed, and a number of groups had their rafts tied together, creating logjams in the middle of the river and making it difficult to get around them when the channel narrowed. We were on the water maybe 10 minutes before the rain began. At first it was light, but then it poured. We kept thinking it would stop, but it never did. We later learned that they were expecting 4-6 inches of rain that day. The operators had no business sending anyone down the river on Saturday. With the cool temperature, the rain was not refreshing, but we muddled along. When the thunder and lightning began, it got scary. Jim and I had long since separated from the others in our group as our thought process was to get the heck to the ending as quickly as possible. There was no safe area to leave the river mid-route. We were on the 6 mile float, which normally takes 4-6 hours to complete, depending on how often you stop. We pulled over under a tree for a short break, thinking we might be able to eat our lunches, but it was just too wet even under the tree. We grabbed a protein bar and gobbled that down, but we began to shiver uncontrollably as we were no longer exerting ourselves. We quickly got back in the kayaks and on our way. Passing the 3 mile marker was very disheartening as we knew we were only halfway done. A lot of people pulled off there, so the river was more open for the second half of the journey. As I came up behind a raft, I saw a young man walking in the freezing river. That can only mean one thing - he was peeing. After he finished he belly flopped onto his raft, causing the other passengers to fly up in the air. Unfortunately that maneuver also caused his swimming trunks to come down. And that is how it came to pass that, despite the clouds, rain and the daylight hours, there was a full moon (as in VERY full) over the Niangua River on Saturday. And I had a front row seat, much to my dismay. We finally reached the 6 mile marker and drug our soggy selves out of the water. We had paddled the route in 2.5 hours! Thankfully a bus was waiting, though it had all the windows open and no heat going despite the temperature being 59 degrees. Only the intern from our office, her dog and her boyfriend were on the bus from our group. The route back to the campsite was up steep hills on a barely-there, deeply eroded gravel road. The driver had to back down the hill one time to let another bus come down. My only thought was it was possible that we survived the lightning on the river only to die on the bus ride back to camp. We later heard that one of the buses slipped and tipped over, and another one hit a car on the way back. As we approached the campsite we were surprised to see that most of our group had either packed up and left, or were in the process of doing so as it was still pouring and predicted to do so throughout the night. How had they beat us back? As it turns out, they all got out at the 3 mile marker and hoped that a bus from our camp would take pity and come and get them. Indeed it did, but they waited 45 minutes in the cold and rain for it to show up. They actually did not get back to camp that much earlier than us. Back at the house, a hot shower never felt so good. We ate our late lunch, then read or watched t.v. for the rest of the afternoon. That evening we found a really good Italian restaurant where we had dinner, and then played cards up until bedtime. Following breakfast the next morning, the other couple took off for home, and we went to Bennett Spring State Park. 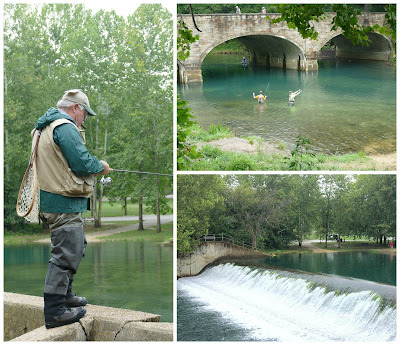 Neither of us had been there before, and we wanted to check it out and watch the fly fishing. Of course it had to rain on us there as well. My cousins in Cincinnati are absolutely the best, even if I feel like I eat my way through the city every time I go there. The family that I stayed with this visit always help me to push the envelope in terms of my palate. Friday night we went to Gomez Salsa, where they offer unique Mexican specialties such as their signature Turtle Shells. I had a burrito that could have fed at least two people. From there were went to the old fashioned ice cream parlor, Algamesis Bro's, which has been in business since 1908. It is no surprise, as the ice cream is delicious! Saturday morning we had breakfast at the house, and then my cousin and I went to the American Sign Museum in Cincinnati. What a fun find! It is located in 20,000 square feet of an old factory building, and covers more than a century of American signage. 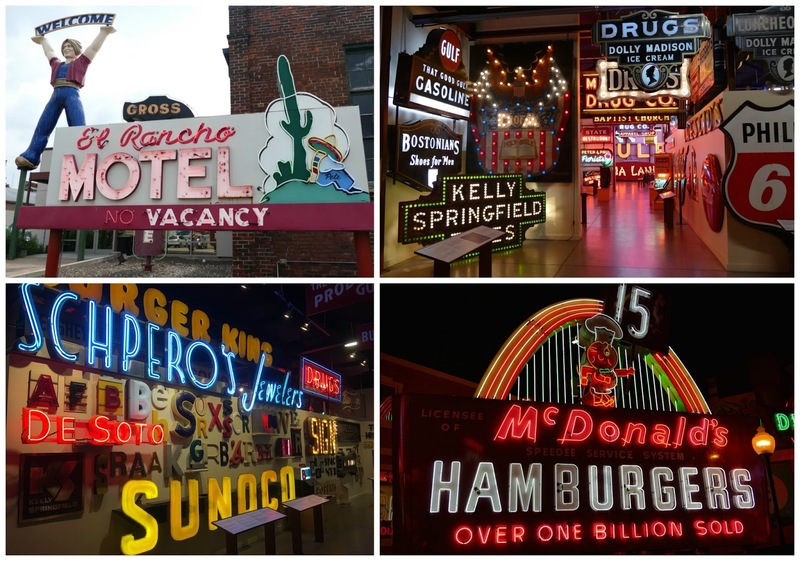 There are early, pre-electric signs adorned in gold leaf, some of the earliest electric signs, examples of beautiful art-deco neon signs, and modern plastic-faced signs. We were really enjoying ourselves except for the group of four families who had 12 kids in total. Those kids were out of control, running, yelling and climbing on the exhibits. Not only were the parents paying no attention, no one from the museum stopped the shenanigans either. When they finally left, the noise level dropped dramatically, and my cousin breathed a sigh of relief. I told her jokingly not to worry, they would show up at the next place we went. Ha, ha...or so I thought. From there we went down to the riverfront as there has been a lot of development since the last time I walked in the area. Because it was 97 degrees and incredibly humid, we mostly did a drive by. But I can't wait to spend more time there when I go back in October. We hit Findlay Market next to pick up some dog food for their dog, and were debating whether to grab a bite to eat. We walked around to see if there were any tables available, and we heard a bunch of kids yelling and screaming. Guess who? Yep, our favorite families from the museum. We busted out laughing! That afternoon there was a surprise party for my Aunt Margie, who turned 95 the previous day. She is my mom's younger sister, and one of two children still living from the family of eight kids. Her sister Betty turned 90 last month. Margie's sister-in-law Marie from her husband's side of the family will be 96 in September, and she is a hoot. All three of these women are a constant source of inspiration as they are active and living on their own. There are some incredible genes in these families, that is for sure. I believe there were around 40 people at the party, and we had a lot of fun and laughs. Sunday another cousin met us for brunch at a dim sum restaurant. This was my first experience with this style of dining, and I really liked it. It was fun to hear the wait staff explain each dish as they brought it by, and then say yes or no to trying it. For me it was a good way to try various dishes that I would not have ordered on my own for fear of not liking it. Then that evening we met yet another set of cousins for supper. There are always so many people I want to see when I go back to Cincinnati, that it is hard to fit everyone in. Fortunately there is a family reunion in October so my next visit I can see a slew of people in one spot. Leaving Cincinnati the next morning, I stopped at a Kroger store to stock up on goetta. And in Kentucky I spied a Skyline Chili sign. As it was 11:00, I just had to stop for a taste of Skyline before I headed home since the Empress Chili I had while staying in Alexandria did not do it for me. As I said, I eat my way through Cincinnati when I visit there. Good thing it is only twice a year!